Please be aware that there are some height and weight restrictions for each of the attractions. Specific information can be found at https://sg.megaadventure.com/height-weight-requirements/. Lockers and bottled water are provided. Collection Information Tickets must be redeemed either at the Siloso Beach or Imbiah Hill Mega Adventure Ticketing counters. Please ensure that you have your iVenture Card with you. The daring Thrill Seeker Package includes the Mega Zip and Mega Jump activities. Mega Zip combines adrenaline, speed and fun to let you fly like an eagle! At 75 metres high, 450 metres long and heart pounding speeds of 60kph, Mega Zip is the first 3-wire zip line built to test friendships as you race your mates or family in an exhilarating, breathtaking adventure from the jungle canopy of Imbiah Hill to the white sands of Siloso. The daring Thrill Seeker Package includes the Mega Zip and Mega Jump activities. Mega Zip combines adrenaline, speed and fun to let you fly like an eagle! 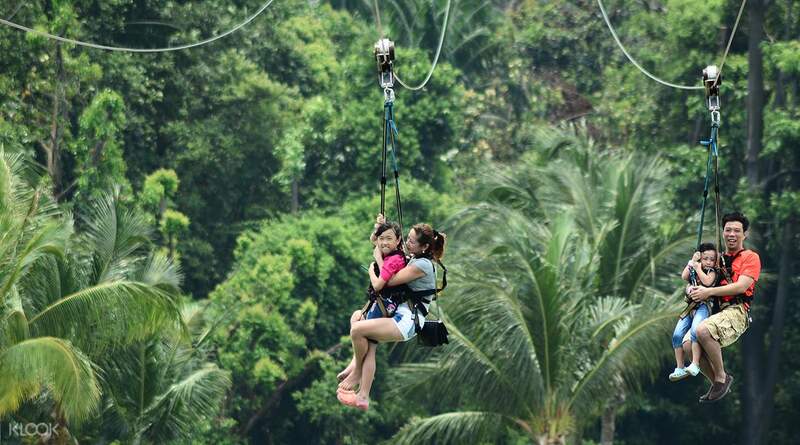 At 75 metres high, 450 metres long and heart pounding speeds of 60kph, MegaZip is the first 3-wire zip line built to test friendships as you race your mates or family in an exhilarating, breathtaking adventure from the jungle canopy of Imbiah Hill to the white sands of Siloso Beach finish point. At the MegaJump leap point, the views are amazing. Ocean, jungle, palms swaying in the breeze, white sand beaches and a 15-metre drop to the onlookers below! A custom-made safety wire and harness developed in the UK and controlled with clockwork efficiency our experienced staff is a first for Singapore and allows you to replicate a free fall parachute jump - without the plane ride. Beach finish point. At the Mega Jump leap point, the views are amazing. Ocean, jungle, palms swaying in the breeze, white sand beaches and a 15-metre drop to the onlookers below! A custom-made safety wire and harness developed in the UK and controlled with clockwork efficiency is a first for Singapore and allows you to replicate a free fall parachute jump - without the plane ride. Mega Adventure Park is located on the picturesque Sentosa Island, host to Singapore’s main attractions. 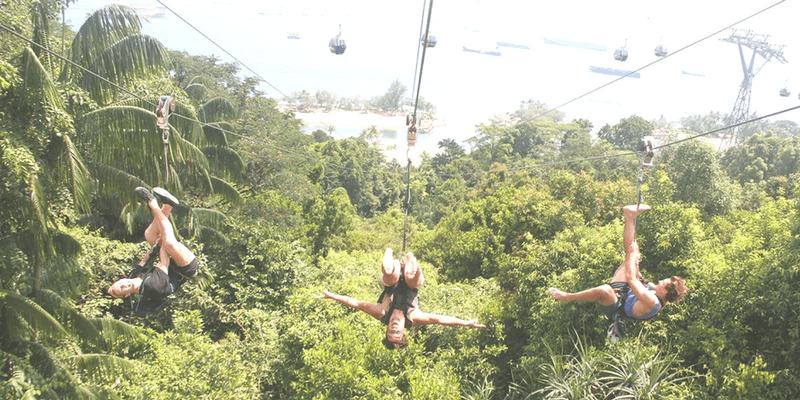 The Thrill Seeker package includes the Mega Zip - South East Asia’s steepest zip wire (flying fox), that spans 450m, where you fly at 60kph over the jungle and beaches of the Island as well as a 15m free fall simulator (Mega Jump). Suitable for the entire family, this is a must do for all adventure seekers! From the Sentosa Beach Station, walk 800m along Siloso Beach Road, and the counter for Mega Adventure Park will be on the left. Alternatively, you can hop on the free beach tram towards Siloso Beach and alight at the 3rd stop. Patrons are encouraged to wear clothes that are not too loose and baggy, skirts and dresses in particular are not recommended. It is encouraged that you cover your shoulders, waist and thighs so that the harness can be as comfortable as possible.